Beet tops harvesting is a complex task of the sugar beet growing industry which forms the qualitative indicators of root crops during their further digging out from the soil and determines the loss of tops and sugar-bearing mass. In the development of theoretical foundations of the optimal tops cutting from heads of sugar beet root by different types of topping working bodies should take into account forces which act at the same time and the rational cutting height. Theoretical researches having been carried out hitherto concerned only the detailed analytical description of the functioning of the new designs of topping working bodies and practically did not concern the general provisions of the separation tops from the head of root crop. The aim of this study is the theoretical determination of the forces that occur at the contact point of cutting working body of topper machines with root crops head of sugar beet root crop. When carrying out theoretical studies are used the methods of mathematics, theoretical mechanics, strength of materials, methods of programming and numerical calculations on PC. As a result, of the theoretical research new analytical dependencies of force describing the processes of crumpling and subsequently cutting of sugar beet heads by topping working body, depending on the size and shape of root crops heads and design parameters of topper have been obtained. As a result, of numerical calculations on PC critical level value of penetration of the cutting element of topping working body into root crops head of sugar beet and maximum value of cutting force at which ejection of root vegetables from the soil doesn’t take place, was defined. The obtained theoretical dependencies and values of normal reaction and cutting forces are the basis for the further working out of a mathematical model of dynamic interaction system of cutting working bodies with the heads of sugar beet. Considered are the problematic issues of tillage on slopes and presented the methodological aspects of theoretical analysis and experimental research. The production testing of the work of tillage equipment in the circumstances is being taken into account for the conservation of soil fertility. It is considered that the ploughs are often used on sloping lands for primary tillage, although the use of special tools for subsurface of the soil conservation tillage is preferable. 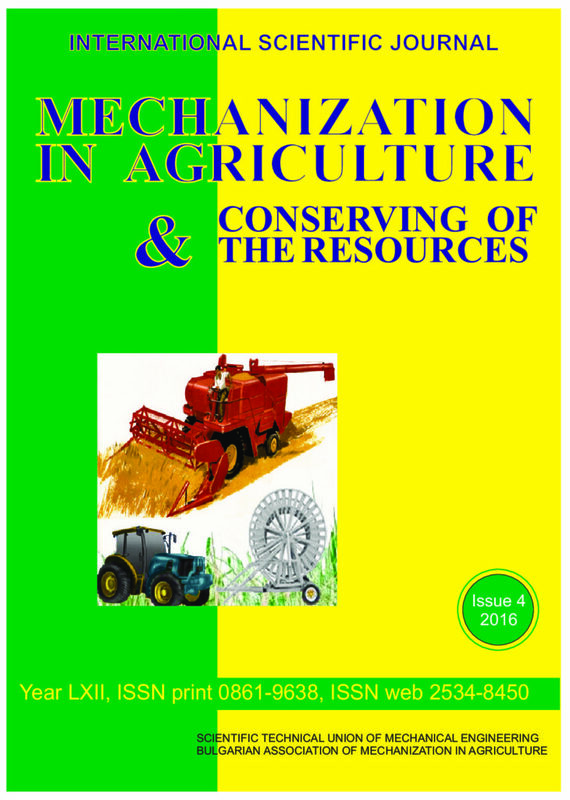 Given here are the scientific-theoretical and practical recommendations on the use of the complex contour tillage machines and drainage system in the agriculture fields with complex terrain. The technological processes in growing crops follow specific sequence and every diversion from the quality indicators leads to unintended negative consequences. Sowing is a continuation of the pre-sowing soil treatment, which, in its turn, is a continuation of deep ploughing. In conventional farming, a number of advantages of deep ploughing can be lost unless an appropriate pre-sowing soil treatment is applied, followed by laying the seeds in the ground under optimal conditions. In the cases, when the choice of technology for growing and harvesting row crops, and more specifically, the type of tillage applied, is a result of analysis of physical, mechanical, chemical and biological properties of the soil, a reduced number of soil treatments can be suggested, or, in some cases, even implementing the subsequent technological processes after no till treatment. A great number of farmers do no not possess the technological set of machinery for implementing innovative technologies. In such cases, the possibility of quick reconstruction of existing machinery, which should be able to operate following different technological sequence. Sowing is the most important of all technological processes and the preparedness of seeders to work in an integrated mode is of extreme importance, so that the can meet the challenge of reduced number of soil treatments. The aim of the research was to compare the impact of organic and conventional farming systems on soil quality with respect to trace elements (TEs) status. A study was carried out on seven pilot farms located in Vojvodina, the northern part of Serbia. The investigation was conducted at three representative farms certified for organic production and four conventional farms, in total on 96 production fields with different history of farming practices. Total and plant-available concentrations of TEs (DTPA) were determined in soil samples taken from 0-30 cm depth. The concentration of TEs was measured by atomic absorption spectrometer (AAS). Intensive cultivation has resulted in an accumulation of nutrients and hazardous substances in the soil. These solutes represent a potential risk to the quality of both surface and groundwater. It is of vital interest to know the quantity and quality of seepage water which leaves the root zone, then enters the aquifer and finally the surface water system. To solve the problem we carried out trials at different scales to get information on how different land management methods influence the amount and quality of seepage water. We used direct lysimetry methods for measuring water and solute fluxes in soils. The combination of lysimeter studies with field experiments at different scales opens new possibilities for modelling and management of watersheds. The paper informs about advances in lysimeter techniques and technology and gives a practical application of this technique to measure the amount of dew. Based on an example the combination of lysimeter measuring results with the WebGIS based model STOFFBILANZ for calculating nutrient balances at catchment scale will be shown. Irrigated agriculture is the largest water consuming industry in agricultural sector of Kazakhstan consuming up to 70% of the total water resources consumed by all sectors of the economy. One of the methods for increasing the irrigation water efficiency is the construction of technically advanced irrigation systems, allowing use of water-saving irrigation technology: drip irrigation, enabling to save irrigation water by 20-30% and increase the productivity by 2.0-2.7 times. Against the background of ongoing eutrophication of the Baltic Sea, this study examined drivers and constraints for implementation by farmers of measures to minimise nutrient losses to waters. The research was conducted in two Polish regions (Mazovia and Pomerania) and included 28 agricultural farms. Four remediation tools were tested and the results evaluated. The study clearly demonstrates the need for greater awareness among farmers of nutrient flows and management on their farms, especially in a changing world requiring them to be better prepared to show flexibility in their production. The region of Varna proved to be a driest in terms of precipitation in this country. Trend test applied to climate datasets reviled a significant increase for seasonal reference evapotranspiration ETo during 1970-2004. Detected climate variability&droughts create uncertainties for maize irrigation scheduling and harvested yield. To cope with them, simulations have been performed for past (1951- 1984) and present (1951-2004) weather conditions using the validated water balance WinISAREG simulation model for two maize hybrids of different sensitivity to water stress grown on a Haplic Chernozem soil of medium water holding capacity. The study compares three irrigation scheduling alternatives built in agreement with past studies to develop environmentally sound/water saving irrigation technologies that consist of refilling the soil reservoir by adopting a management-allowed depletion fraction (MAD): (1) MAD=0.50; (2) MAD=0.33; (3) MAD=0.50 but partially refilling the soil reservoir. Simulations relative to the very high irrigation demand year of the current weather show that when aiming at maximum yield all three scheduling alternatives require the same irrigation depths ID=360mm that is 60 mm higher than conventional advised in the region. In the average demand years of past and current weather, Alternative 1 requires the same ID=270mm while a smaller ID=240mm is simulated with both alternatives 2 and 3 due to the fact that available soil water ASW is presently depleted to the optimum yield threshold OYT at harvest. Bioremediation is the enhancement of live soil organisms as fungi, bacteria and plant to break down hydrocarbon and organic contaminants. For achieving the bioremediation method one took soil samples with different concentrations of petroleum products, from different parts of the petroliferous exploitation Suplacu de Barcau. Out of these collected soil samples, the microorganisms were isolated and analyzed all their characters and for identification were used the Galleries API 20E, 20NE and 20Strep. The obtained pure cultures were tested on agar media enriched with different concentrations of crude scaffolding oil, as the sole source of carbon. The bacteria that were validated in this study constituted then the bacterial consortium used for bioremediation. This consortium was applied on polluted soil with initial different TPH concentration. Regarding the initial concentration of mineral oils and extractable petroleum products, this varies in a very large range but during the whole bioremediation process, one noticed a decrease of the petroleum products concentration.